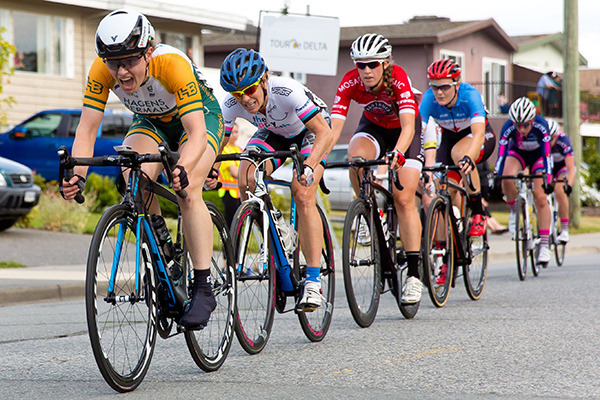 BC Superweek kicked off this weekend with the Tour de Delta's MK Delta Lands Criterium. The Tour de Delta and BC Superweek started off with a bang, literally, as Delta Councillor Sylvia Bishop fired her starter pistol to mark the beginning of the MK Delta Lands Criterium. Dozens of riders from across the globe raced along the 1.2-kilometre loop around Richardson Elementary School as cycling enthusiasts and curious locals alike cheered them on. The riders completed as many laps as they could in the time allotted — 50 minutes for the women and 55 minutes for the men — plus five additional laps. The women took to the course first, with most riders adopting a conservative strategy for the majority of the race before becoming more aggressive during those last five laps. In the end, former Canadian Olympian Joelle Numainville of Laval, Que. (Cervelo Bigla Pro Cycling Team) emerged victorious, finishing just ahead of Vancouver’s Stephanie Roorda (Team Canada) and Bountiful, Utah’s Tina Pic (The Happy Tooth Pro Cycling). Competitors in the women’s race push up the hill and over the speed bumps on 83 Avenue during the MK Delta Land Criterium on July 8. Numainville represented Canada at the 2012 London Summer Olympics, finishing 12th in the road race, and said she’s riding in the Tour de Delta and BC Superweek as a way to stay sharp, regardless of the results. At the men’s race, Silber Pro Cycling came out on top for the third straight year, albeit with a different rider taking home first place. With Silber veteran Ryan Roth looking to three-peat at the race, it was his teammate Elliot Doyle of Laval, Que. who was able to surge ahead of the pack to claim first place. Florenz Knauer, who’s from Germany but listed his hometown as Delta on his registration for BC Superweek, came in second ahead of Doyle’s teammate Kris Dahl of Calgary, Alta. “It’s special for me because in my first year I met my girlfriend here. Since 2013, we’ve been together and in September, I’m looking to move here to make it serious,” laughed Knauer. BC Superweek is Canada’s biggest professional cycling series and features more than $125,000 in prize money available during eight races over 10 days. 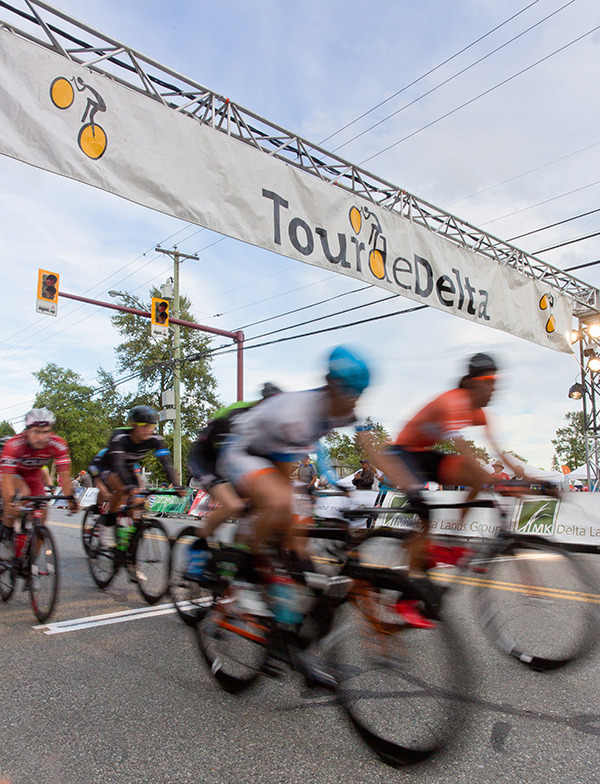 BC Superweek runs from July 8 to 17, and is made up of the Tour de Delta (July 8-10), the Global Relay Gastown Grand Prix (July 13), the Giro di Burnaby (July 14), the PoCo Grand Prix (July 15) and the Tour de White Rock (July 16-17). For more information, visit bcsuperweek.ca. For full Tour de Delta race results, visit: tourdedelta.ca/ race-details/race-results. Competitors fly through the finish line at the MK Delta Land Criterium on July 8.